If I open in Firefox it work well and I can see all the documents. How could I Fix it. Microsoft has removed support for older versions Of Internet explorer. So it only works if its IE 10 or above and Edge in case of Modern list and libraries experience. So, if you have the modern experience and need to use IE, you should switch back to the classic list experience using "Return to classic sharepoint" link. If its affecting all users, then just change the tenant level settings to classic experience (using above link). 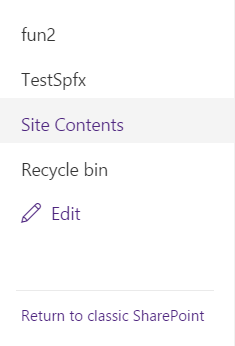 You will find "return of classic sharepoint" in the left navigation as below. 3) Scroll down to SharePoint Lists and Libraries experience. Now wait for about 24 hours for this to take effect. Please check your IE version is compatible with new SharePoint Document Library view or not? It is support in Internet Explorer 10 and 11. Not the answer you're looking for? Browse other questions tagged sharepoint-online document-library internet-explorer or ask your own question.